This plant is an annual found on chalky soils or well drained sandy soils. It has always been associated with arable areas. The advent of intensive farming with increasing use of herbicides and fertilisers has hit this plant hard and there are now only two sites in administrative Oxfordshire where it still occurs: one in Vice-county 22 and one in Vice-county 23. Of these two remaining sites, one is on the floor of an old quarry, which is surrounded on two sides by arable land, the other is a strip of rough grassland, on land which used to be farmland, but is now a golf course. The owners of these two sites are aware of the plant’s existence and are helping towards its continued existence. As one would expect with an annual the numbers of plants fluctuate from year to year. In the old quarry in the mid 1990s the numbers were over a thousand, but in recent years they have varied between 60 and 200. They are also noteworthy for being extremely small. However they do set seed and the seed bank still appears viable. The method of monitoring in the quarry, was set up when the numbers were very high: a transect line is laid out across the quarry floor and 1 metre quadrats are surveyed throughout the length, making 42 quadrats in all. In addition a further 6 quadrats are surveyed in the rest of the quarry. The same quadrats are monitored each year. Sometimes it is noticeable that where there was a particularly vigorous plant one year the same quadrat will have a large number of plants the next year, but this is not always the case. An estimate is made of how many uncounted plants are also present. There are two other notable species present: Centaurium pulchellum, lesser centaury and Iberis amara, wild candytuft. This land is private so if you wish to visit, join our monitoring day, details of which are on the Rare Plants Group events programme. The other site is on a former farm which has now been converted to a golf course. A Site of Special Scientific Interest was established along one edge of the rough where the Filago pyramidata and other arable flowers grow. 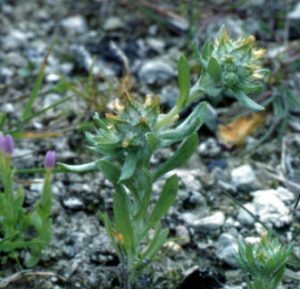 The problem here is that both Filago pyramidata (the rare broad-leaved cudweed) and Filago vulgaris (the commoner, common cudweed ) are found together and are not easy to tell apart. Genetic work shows that the two species do not hybridise. Both Cudweeds are annuals so do not occur in exactly the same spot each year. The numbers of plants vary from year to year; some years no plants have been identified with complete certainty. 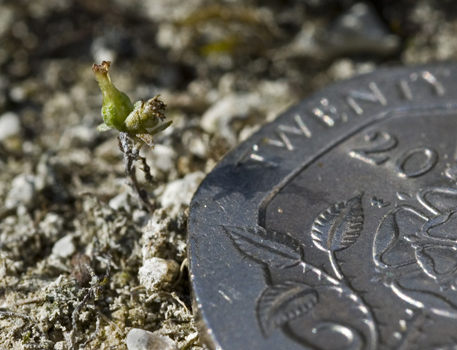 In 2007, though, 12 good plants were found, sufficient, it is hoped, to maintain the seed bank. And in a Botanist’s Garden . . 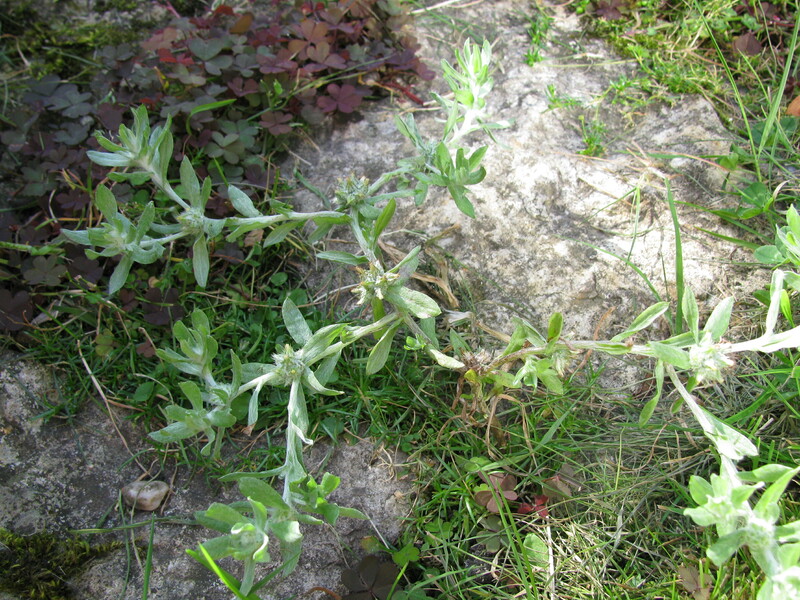 In August 2009, on returning from holiday I noticed an unusual “weed” in my garden. On closer inspection it turned out to be Filago pyramidalis. The seed must have arrived on my shoes after I visited one of the sites. It continued to flourish throughout the autumn and grew much larger than I have seen it before. By December 17th I thought it unlikely to survive much longer. By then there were three main stems each over 6 inches long and quite bushy. I picked two of them and pressed them; the third I left to see how long it would survive. The snow arrived on January 5th and covered the garden to a depth of 4 inches. When the snow finally melted on January 13th, I was amazed to find the plant still green if a bit sorry for itself. However a covering of very wet snow which froze hard on the 19th finally killed off this annual. Now I am hoping that seedlings will appear again this summer!